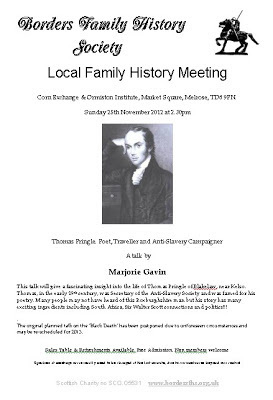 Our next meeting is on Sunday, 25 November at 2.30pm in the Corn Exchange in Melrose, when Marjorie Gavin returns with a talk about Thomas Pringle of Blakelaw, near Kelso; a poet, traveller and anti-slavery campaigner - Thomas, in the early 19th century, was secretary of the Anti-Slavery Society and was famed for his poetry. Many people may not have heard of this Roxburghshire man but his story has many exciting ingredients including South Africa, Sir Walter Scott connections and politics ! The original planned talk on the 'Black Death' has been postponed due to unforeseen circumstances and may be re-scheduled for 2013.